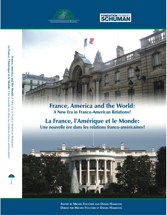 Home > Articles > Publications > France, America and the World: A New Era in Franco-American Relations? France, America and the World: A New Era in Franco-American Relations? The relationship between the United States and France faces challenges but decision-makers could also seize upon a great opportunity to rebuild a strong transatlantic partnership. Editors Daniel Hamilton and Michel Foucher have collected a comprehensive set of perspectives on this relationship from decision-makers and key figures in both France and the United States. Discssing issues of global security to economics and foreign relations, authors include: Nathalie Delapalme; Daniel S. Hamilton; Ian O. Lesser; Bruno Tertrais; Jean-Pierre Filiu; Jean-François Jamet; Leo Michel; Celeste Wallander; Michel Foucher; Maxime Lefebvre; and Gwendolyn Mikell. To order this title, click here.